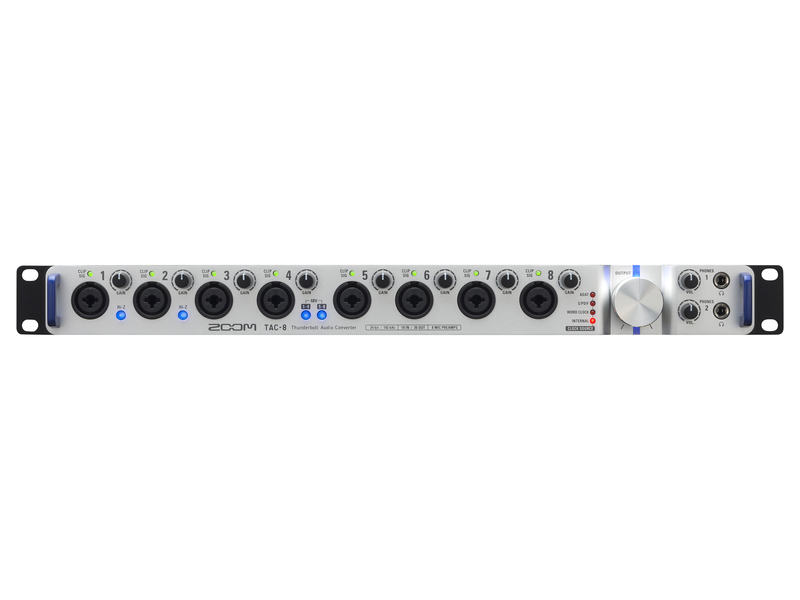 The rack-mountable TAC-8 audio interface is designed to act as the central hub in both professional and home environments. It provides 8 analog inputs and 10 analog outputs, 10 digital inputs and outputs (in both S/PDIF and ADAT Optical formats), and both Word Clock and MIDI I/O. Whether you want to record large scale multi-channel 24-bit/192k sessions in your studio without worrying about latency or you want to bring your onstage performance to new heights, the TAC-8 allows you to take full advantage of today's latest technology. With 8 analog inputs, 10 digital inputs, and the ability to record and play back 8 channels simultaneously, the TAC-8 allows you to record what you want, when you want. Lay down full backing tracks—drums, bass, guitar, keyboards, even vocals—at the same time, or go big with an 8-mic drum setup, or anything in-between. Thunderbolt's speed ensures you won’t have to deal with latency issues, and the TAC-8's built-in software mixer and flexible output options let you customize each session to your needs. Whether you're a one-man band with an epic onstage rig or your laptop is serving as the central hub for multiple musicians accessing software effects and virtual instruments, the TAC-8 allows you to fully customize your performance setup according to your needs. Simply connect it to your computer with a Thunderbolt cable and then connect the rear panel TRS outputs to your mixing board or PA system. Wherever you play, you can count on your TAC-8 to deliver the ultimate in high quality audio. Thunderbolt technology opens up new doors for creators. More than twice as fast as USB 3.0—not to mention twenty times faster than USB 2.0 and twelve times faster than Firewire 800—Thunderbolt is the interconnection technology of the future. Co-developed by Apple and Intel Labs, it allows signal to be transferred at an incredibly fast 10 gigabits per second, which means virtually no latency. Thunderbolt interfaces such as the TAC-8 are also unaffected by computer jitter (slight variations in timing). The TAC-8 provides a wide variety of both analog and digital connectors. 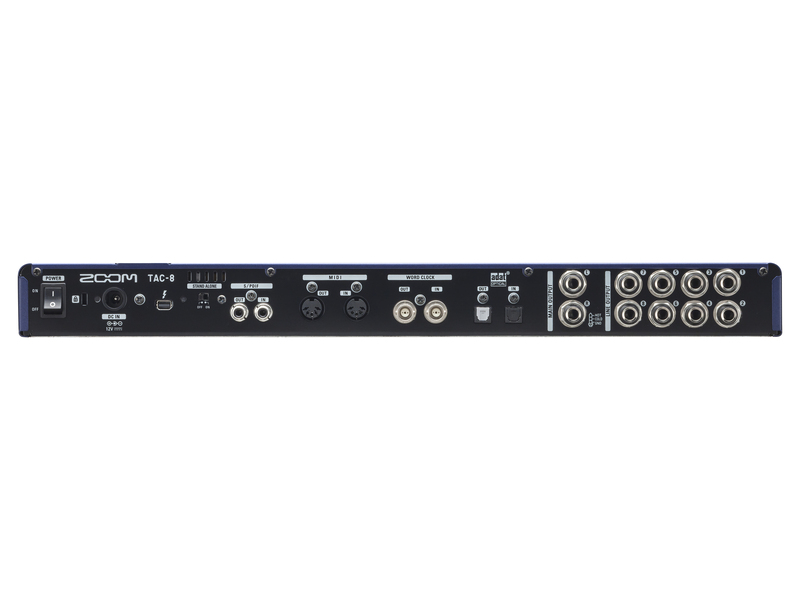 Eight front panel combo XLR/TRS inputs accept mic- and line-level signals. Inputs 1 and 2 can also accept instrument-level signal from electric guitars and basses. Dedicated input gain controls and Clip LEDs make it easy to set optimum input levels, and a Phantom Power switch enables the use of condenser microphones. Dual balanced analog ¼" TRS output jacks allow you to connect the TAC-8 to amplifiers or self-powered speakers, and there are also 8 discrete balanced TRS analog line outputs for multichannel monitoring or connection to external effects devices. A large front-panel Output knob offers fast control over output level, and there are two independent ¼" stereo headphone jacks, each with its own dedicated volume control, for private monitoring. 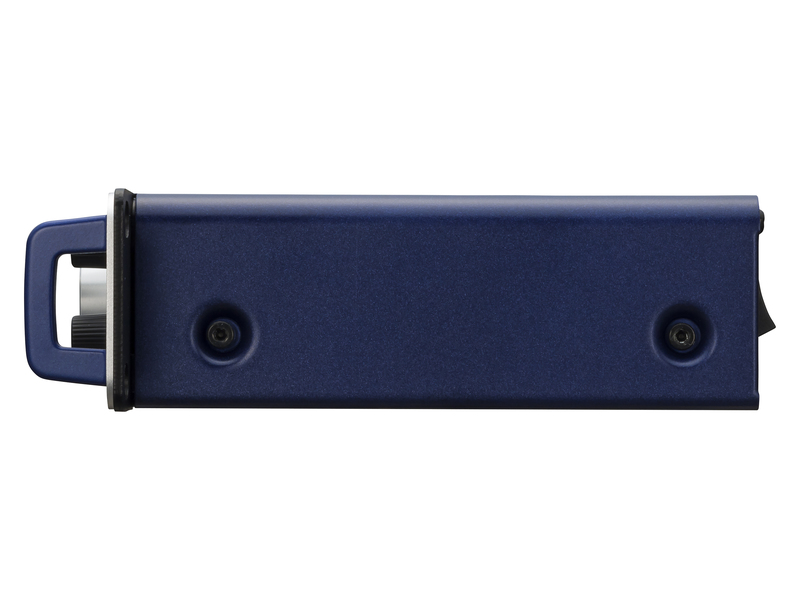 The TAC-8 provides 10 channels of digital inputs and outputs, including 8 channels of I/O on ADAT Optical connectors and an additional 2 channels on S/PDIF connectors. In addition, Word Clock I/O enables the TAC-8 to be easily integrated into any system. In addition, MIDI In and Out allow electronic keyboards, sequencers, and drum machines to be connected to the TAC-8, with Thunderbolt speed ensuring precise audio and MIDI sync. In standalone mode, the TAC-8 can be used as an 8-channel mic preamp and analog-to-digital or digital-to-analog converter without being connected to a computer. The TAC-8 performs 4-times upsampling during both analog-to-digital and digital-to-analog conversion. In other words, when the sampling frequency is set to 44.1kHz or 48kHz, the signal is processed at high resolution 176.4kHz or 192kHz, respectively. For A/D conversion, this means less aliasing noise; for D/A conversion, this means increased clarity and fidelity. 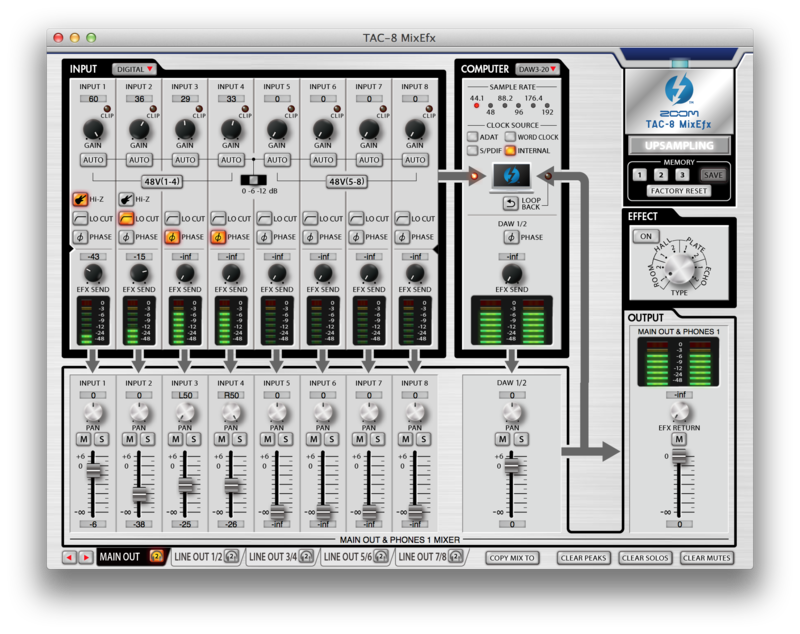 TAC-8 MixEfx is a free Macintosh application designed specially by Zoom for the TAC-8. It provides a comprehensive onscreen mixer, with independent level, phase reversal, and panning control for each channel. TAC-8 MixEfx also allows you to freely route all inputs to all outputs and to create custom mixes for each pair of outputs. In addition, a variety of reverb and echo effects can be added on a per-channel / per-output basis. Complete mixes can then be stored in three different memory slots, allowing instant total recall. 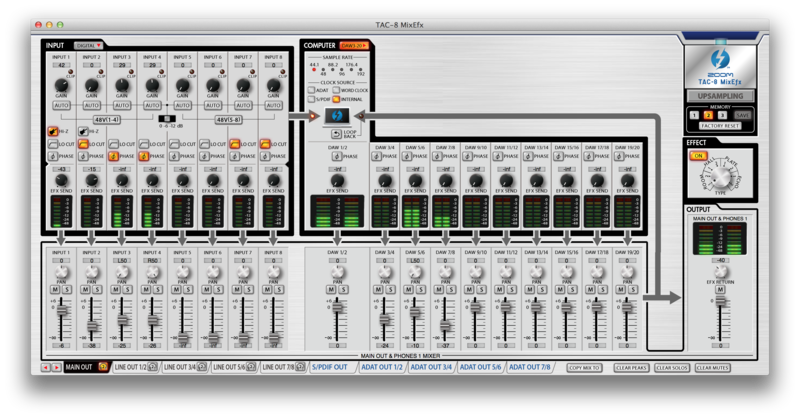 Download TAC-8 MixEfx software now. The Zoom TAC-8 comes with a free download license for Sternberg’s Cubase LE music production software, providing not just the ability to capture incredible high-resolution / low-latency audio in every box, but to do spectacular things with it. Take your recordings to a more professional level. 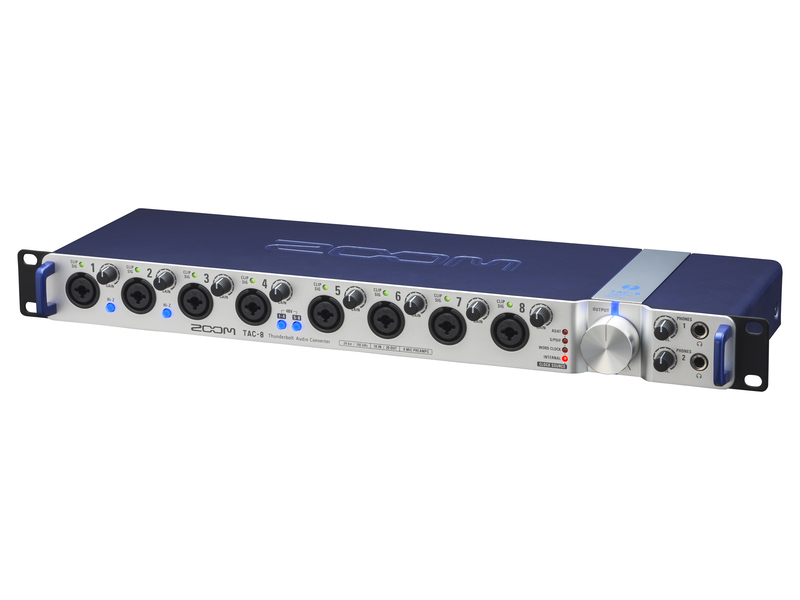 Steinberg’s powerful and state-of-the-art audio software used by creators around the world now comes with every Zoom TAC-2, TAC-2R, and TAC-8 purchase. * TAC-8 is not compatible with Windows PC. The TAC-8 is designed to serve as the central hub in both professional and home environments. 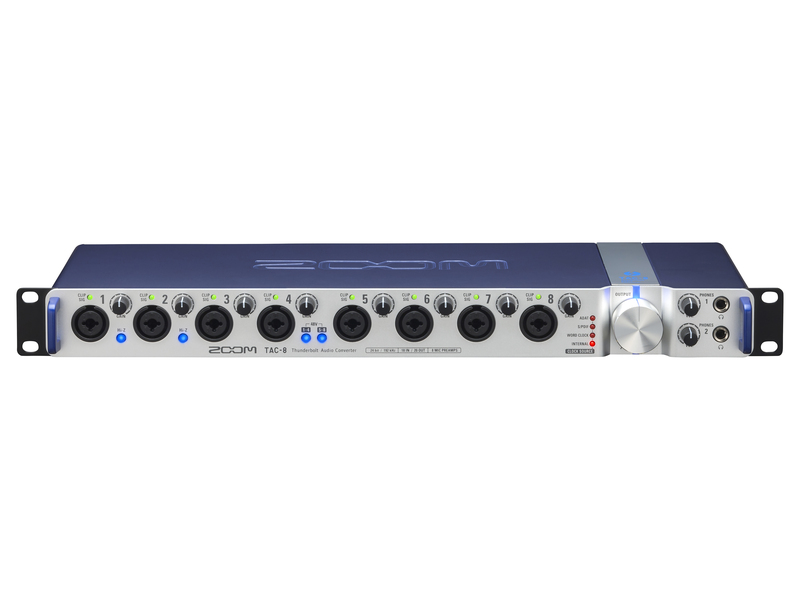 With its eight analog and ten digital inputs, and twenty analog and digital outputs, the TAC-8 allows you to do large scale multi-channel recording sessions with near zero-latency. Sound on Sound magazine with a brief interview regarding the ZOOM TAC-8 and TAC-2R at NAMM 2015.